Nissan is a name known around the world for quality and performance in material handling equipment. It offers a broad range of solutions that deliver exceptional performance, safety and efficiency. Whether you’re shopping new or used Nissan forklifts in IL, or you need to find a dealer capable of shipping to your international location, Chicago Industrial can meet all of your requirements. Nissan has joined forces with TCM to launch the UniCarriers brand of material handling equipment. Among our extensive inventory of new Nissan lifts, you’ll find everything from IC cushion and pneumatic tire models to electric rider trucks, pallet trucks and tow tractors. Chicago Industrial also carries Nissan reach trucks and order pickers in addition to flexible and cost-effective walkie stackers and hand pallet trucks. Nissan forklifts are among the most reliable, durable and innovative in the industry. We can custom-configure most models to your specific applications, and you’ll benefit from a range of standard features such as full-suspension seats, on-demand hydraulic power steering and available options for chassis, mast and operator compartments. With a range of lift capacities and fuel sources, you’re sure to find the Nissan lift suited for your work environments. 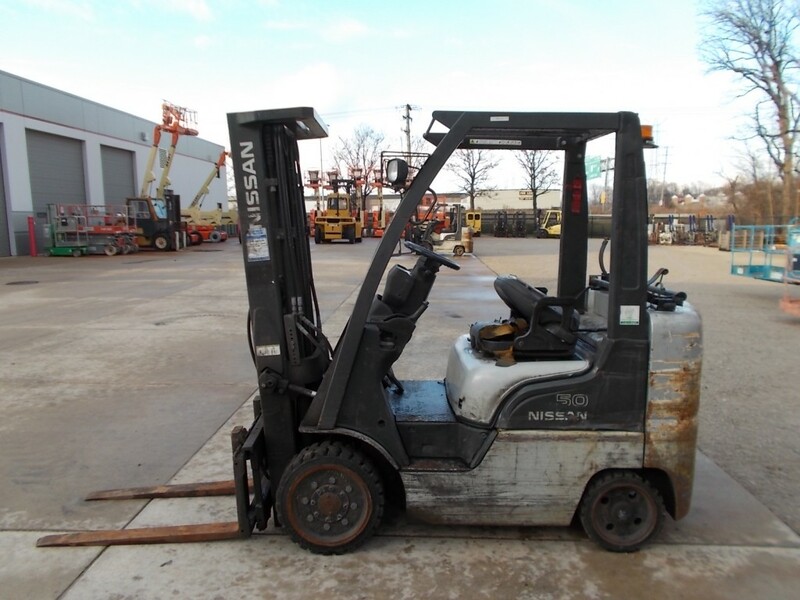 Within our eight-acre facility in Rockdale, IL, we’re able to completely recondition used Nissan forklifts to look and perform like new. Chicago Industrial’s 40,000-square-foot showroom ensures we have ample space to house one of the largest inventories of top-quality used material handling equipment. With over 500 pieces of equipment in stock, including late-model, low-hour Nissan forklifts, we deliver the value and selection your company needs to succeed. As a one-stop shop for material handling solutions, we make the process of buying forklifts easy and convenient. Along with competitive prices on equipment by a manufacturer you know and trust, we also can arrange for flexible financing options through a highly rated nationwide lender. Simply pick out the Nissan lift you’re looking for and complete your online application in just a few minutes. Within 24 hours, you’ll get more information about your financing options. We’re not just the go-to source for new and used Nissan forklifts for sale in IL and the Chicago area, but we also ship lift trucks all across North America and to locations around the world. Give us a call today at 815-744-8811 to speak to a knowledgeable representative for details and cost estimates for shipping equipment to your area. Take a moment to browse our current inventory of new and used Nissan forklifts for sale. You’ll find that we carry an extensive range of options to fit almost any budget. Don’t see exactly what you’re looking for? Just let us know your specific requirements, and we’ll be happy to find a lift truck capable of handling your toughest applications.